I’ve been wrong plenty of times in my life—but on the matter of Newt Gingrich versus the Mainstream Media, I could see this one coming down the tracks a good 12 hours ahead of time. 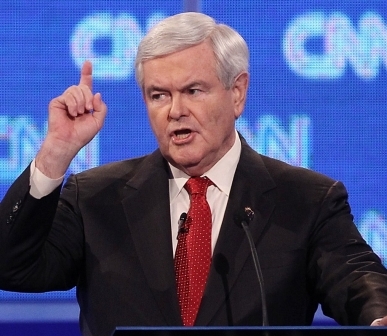 Newt played it perfectly in last night’s debate. It was like watching a power hitter connect flush with a fastball and knock the thing over the third deck and out into the street. CNN’s John King started the debate with the question about ABC News’ interview with Gingrich’s ex-wife Marianne in which she says Newt wanted an open marriage. I am appalled that you would begin a presidential debate on a topic like that. Newt, one of the best politicians ever at the art of outraged indignation, channeled everything he’d ever been angry at in his whole life. And he was just getting warmed up. Every person in here knows personal pain. To take an ex-wife and make it, two days before the primary, a significant question in a presidential campaign is as close to despicable as anything I can imagine. The CNN debate moderator reels from the blow to his political solar plexus and stammers about how it was ABC’s interview with the ex-wife, not CNN’s. Cue Newt’s undiscovered, new, even deeper depths of scorn and derision. John! John! It was repeated by your network. You chose to start the debate with it. Don’t try to blame somebody else. You and your staff chose to start this debate with that. Game. Set. Match. The rest of the debate would never again reach those heights of electric drama. Later on CNN, former advisor to the Presidents, David Gergen, said he thought it was one of the most memorable debate moments in American history. CNN did a nice job after the debate dealing directly with the explosive first question to Gingrich. John King took full personal responsibility for asking the question and making it the first of the debate – didn’t pawn it off on his staff and didn’t apologize for it. He noted, as have other journalists, that Newt had been asked the very same thing earlier in the day and there was none of the theatrical anger. But King seemed to understand Newt is very good at the art of the media smack-down and essentially said- I’m a big boy, I can take it. And Newt- truly the consummate actor (I don’t say it disparagingly- it’s a wonderful skill for a politician to have) told CNN’s Anderson Cooper in the post-debate spin room, that he thought John King did an excellent job as a moderator. It had the feel of hockey players who had just knocked each other’s teeth out- shaking hands and hugging after the game. Over on Nightline, ABC aired the actual interview with Marianne Gingrich that contained what turned out to be the only semi- newsworthy moment- the stuff about Newt wanting an open marriage, which they had pre-released in the morning. This was no scoop. She had said the same thing last year in a print interview. But ABC went through all the “exclusive” motions. But credit to ABC for a couple of things. They kind of downplayed it on the World News with Dianne Sawyer earlier in the evening, leading with good news about General Motors auto sales. Over at rival NBC, Brian Williams led with politics and they made a bigger deal of the Marianne interview than ABC did. And then on the actual Nightline broadcast where the Brian Ross interview with Marianne Gingrich officially ran- they also included every second of Newt’s debate theatrics. It came off as a well-balanced broadcast. I think he’s a much better politician than a lot of people give him credit for. He knows how the game is played. It’s no accident he answered the Marianne questions earlier in the day calmly and rationally. And certainly no accident that with a supportive crowd and millions watching- he would go calculatedly ballistic. And amazingly enough- how you can be calculated and still sincere at the same time- is truly a great political skill. I’d be careful if I were Mitt Romney. This Georgia bull dog is not going down without a fight. He knows how to push the buttons and he’s got an impeccable sense of timing and grasp of the moment. Robert — Good review of what is turning out to be a wild political season. I expect more dramatic happenings. Take a look at my recent blog about Kodak “whiffing” at what I call their “1975 Moment”. I think you’ll find it interesting…and maybe worth a full column by you. As times change faster and faster…every company (including Facebook, Google, Microsoft, Spotify, Pandora, etc.) have to wonder…are they choosing correctly (or incorrectly) at their “Kodak 1975 Moment”. It was a good TV moment for Newt… taking on the “mainstream” media is always going to play well with the conservative base. Despite Newt’s feigned indignation, King’s question was totally appropriate since the wife interview was a big headline, and character IS an important issue. Newt has spent a long time in the academic world… it’s a time proven debate tactic, when you have no defense, change the target and go on the attack. Credit to Newt for using it… shame on anyone in the audience who fell for it.